Synopsis: With the world's population at risk, A few survivors emerge. Throughout recorded history, On a regular basis mother nature cleans out the human species with a pandemic, The most recent being the global influenza outbreak after world war one. Improved medical treatments, Vaccinations and knowledge have shielded humanity from a major pandemic since then, But the question is not whether it will happen again - it is when, where, and how it will start. With scientific, political, And social trends torn from the headlines of recent news, Higher ground: Zero hour explores the ways in which terrorism, government conspiracies, and the growing indifference of humanity could all contribute to a world wide crisis the story focuses on a handful of people who learn the worst is coming, And have tried to sound the alarm, While preparing to survive the collapse of civilization. Banding together, facing unexpected threats, They combine skills and knowledge to meet up at a refuge that will hopefully see them through the worst of what the world is facing. An Ebola outbreak that could leave 90% of humanity dead. 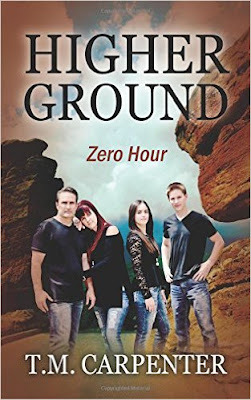 insightful, compelling, and illuminated with characters who are deeply real, courageous, and compassionate, higher ground: zero hour is a thought - provoking thriller that will leave you on the edge of your seat. Review: First of all l would like to say a big thank to T.M Carpenter for sending me his book and giving me a chance to read it. I was sent this book in exchange for a honest review l am glad this book is on my bookshelf. I would tell people that you should step outside your comfort zone with books because it is good to add more authors and genres to your reading portfolio even if you do not read books like this. I normally do not read do not read books of this genre but l stepped outside my comfort zone with authors and genres l am so glad l did because l have read so many great books. I highly recommend this book. T.M Carpenter kindly signed my book. I would love to read more from this author. I was sent this book by bostick communications l want to say a big thank you to them for sending me this book as well. I found this book real easy to get in to and hard to put down once l started reading it. There is 22 chapters and 300 pages in this book and it is a great book and it is a great storyline. I would tell people to read this book for themselves to really know how great this book really is. I wish l could rate this book more then 5 stars but l can not put in to words how great this book is. This book took me four days to read and l fell in love with this book. I would love to read more from this storyline l would read this book again and again it was good to read that Kent and his family helped hunter and Casey l like that Kent's daughter was called journey and his son was called maverick it was good to read that they could get loads of stuff they would stay safe from all the dangerous thing that was heading their way l was sad to read that people had shot six people including a young couple and their baby. river in south Minneapolis. After a visit to Colorado as a young boy, he vowed that one day he would move there, and now he lives with his wife and two children in Parker, Colorado.